A rotary air drum filter is prefered wherever a fine filtration of the micronics dusts particles and re-circulation of the department. Filter is made up of Perforated Sheet with suitable supporting arrangements made out of mild steel with duly powder Coated. Mild Steel outer fixing frame for the above in duly powder coated. Gear box assembly connected with 0.5 HP motors. Suction Nozzle connected with 2HP Blower for waste collection and 0.5 HP Screw Cyclone for Compacting the waste. Mild Steel collection box with grouting arrangements duly powder coated. PVC pipeline and flexible hose for dust material Suction. Imported Nylon Mesh covers a perforated sheet for long life for dust Filtration. The dust removed from the filter is collected in the collection bag. It works at very low filtration velocity. Maintain constant output of exhaust systems and uniform R.H/Suction maintain inside the department. Heat and fluff removal from the department is steady without flictuation. 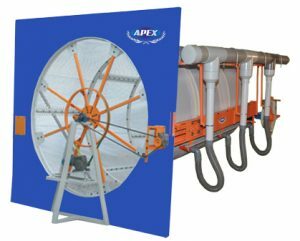 Improves the humidification performance inside department and reduces the files thereby improving the yarn quality. The fluff is collected in an open type bag collector / compacting system. Imported filter media cloth covers drum filter for dust filtration.